I love my PS3 and I’m currently playing Batman Arkham City and Battlefield 3, but I also love going to the theatre and the movies. What’s the difference between what you do in your spare time and what you do at Buro Happold? As Building Information Modeling (BIM) Manager I manage all the Buro Happold BIM developments in the Northern Europe Region from Glasgow. I’ve just spent six months commuting between Glasgow and Berlin. I’m also Chairman of the Glasgow Revit User Group. We meet with like minded professionals covering architecture, structures, building services, contractors and education. One of my key roles is implementing BIM standards across the company which means global markets including China, Russia the US. I’m also Northern Europes Regional Rep on the BIM XC, BFab BIM Group and also sit on the BIMX responsible for global strategy. Yes. I’m a Certified AutoDesk Revit Architecture 2011 Professional. It is a growing field. Each year 150,000 design professionals go in for Autodesk Certification. You’ve achieved a recognised level of experience for companies to show their BIM maturity model ‘credential’ and how well a company is adopting BIM. Buro Happold are leaders in adopting BIM. http://about.me/GrahamStewart. Also note that I am very big into social media and you can find me on Linkedin & Twitter. Have you given up speaking? Certainly not. I will be doing some serious speaking in Las Vegas at the end of the month when I'll be teaching at AU2011 Class ID: SE3520 Title: Modelling Concrete and Steel Projects using Autodesk® Revit® Structure. I’m taking part in Autodesk University in Las Vegas which is where architects, engineers, and designers come together with industry and technology leaders to better understand new technologies, exchange best practices, and form new business strategies. There are 650 + classes on the hottest topics. I am fortunate to have been chosen as one of the 650 speakers out of over 2500 applicants who will be giving 900 classes. Here’s the link to my class. The attendance this year is over 10,000. Classes cover everything from innovation strategies, web, cloud, and mobile technologies, workflows and process, visualization, sustainability, change management, and design leadership, plus intermediate and advanced classes on the latest Autodesk products and suites. Sounds cool. Where is this happening? The Power of the Possible is taking place in the Las Vegas Venetian Hotel from Tuesday November 29th to Thursday December 1st. The four-star Venetian is one of the ‘all suite’ Las Vegas Hotels and the world’s largest diamond resort and casino. It’s 36-storys high and on the Las Vegas Strip. How do you feel about the 6.30am ‘grab and go breakfast’? We’re all there to do some serious learning and serious sharing of knowledge. You mean when the chips are down Las Vegas is work? And then you go where? Boston – I’ll be getting the Red Eye from Las Vegas to Boston to attend my 2nd Gunslinger event at Autodesk’s AEC-BIM HQ in Waltham – where powerusers from around the globe meet with key Autodesk programmers and analysis to develop the next evolution of Revit and to find out what’s store for the future. How did you get into BIM? With 24 years experience I’ve been in at the beginning with BIM. Over the past 10 years I’ve used various .platforms. BIM is constantly changing. Last year I attended the Autodesk BIM conference in London where Paul Morrell, the Government’s Chief Construction Adviser announced the Government’s UK Construction Strategy with an emphasis on the role of BIM focused on delivering cost efficiencies of 20%. BIM has become a buzzword in the UK. The UK Government’s Construction Strategy requires fully collaborative 3D BIM with all project and asset information, documentation and data being electronic as a minimum by 2016. Yes - as long as the construction industry works together collaboratively. To ensure Scotland isn’t left behind we just held the BIM Scotland National event on Thursday 27th October http://www.burohappold.com/knowledge-and-news/article/bim-national-event-scotland-315/ with co-presented with Keppie Design and Laing O’ Rourke. We looked at what we have achieved in past projects and what is being achieved in current projects through innovation. We also identified what we need to know to ensure our projects run smoothly and are successful with the right design teams onboard. 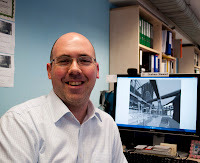 We also had David Philp, Head of BIM implementation for the UK Government Cabinet office at the event. He reinforced that collaboration is the key to success and shared data management. What does 2012 hold in terms of BIM developments? One of the major issues is addressing how BIM can be of value maintaining the asset value of the existing built environment particularly within the public sector looking at health and education. As leaders in the field at Buro Happold we want to use our expertise to the benefit of private developers and the public sector including Local Government. We are also looking more into BIM Management and how our SMART BIM++ tools can help us achieve key goals and targets. The future does look exciting and with new technology and processes being developed all the time we need to ensure we are at the forefront of BIM adoption.